The second Hungarian event of the MyStory project organised by the Hungarian Moving Image and Media Education Association will take place in Subotica, Serbia on the 29th of this April. The authority, the Orbanian “illiberal democracy” (also known as autocracy) has completely sealed the country, making it impossible for asylum seekers to enter, many of whom are still hoping for a miracle a few kilometers from the border, in Subotica. On the morning of the 29th of April five professional journalists, who have been regularly reporting about the refugee crisis, will be making television interviews with refugees waiting to enter the transit zone at the refugee camp of Subotica, and also with Pakistani refugees hoping to cross the border illegally hiding in the nearby forest called the “jungle”. 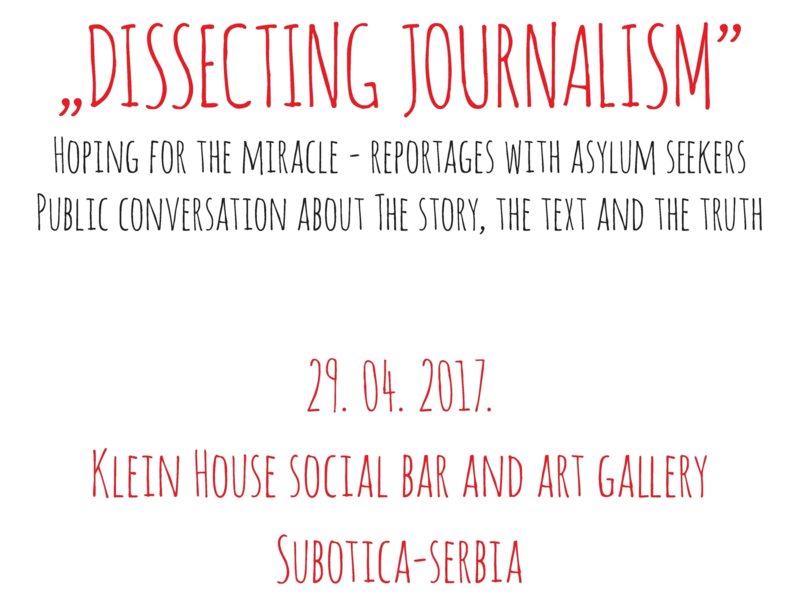 The fresh interviews will be edited on the spot, so that we can discuss the material together with our audience of 60 people, mainly consisting of local high school students and the interested Hungarian minority, at the Klein House Social Bar and Art Gallery on the afternoon of the same day. The discourse will be concentrating on topic choice, interview techniques, environment depiction, editing decisions, ethical journalism practices and the messages of the interviews. We will also be discussing the differences between materials shot in “real action” for the news media and interviews made in these “modeled” situations. These events have a particular atmosphere when interview subjects are also present and have a chance to take part in the discussions about the depiction of their personalities and circumstances in the news media. The occasion will be recorded with the purpose of making an educational video about this special kind of “vivisection”.